I am writing tonight from the beautiful Tampa Bay area. 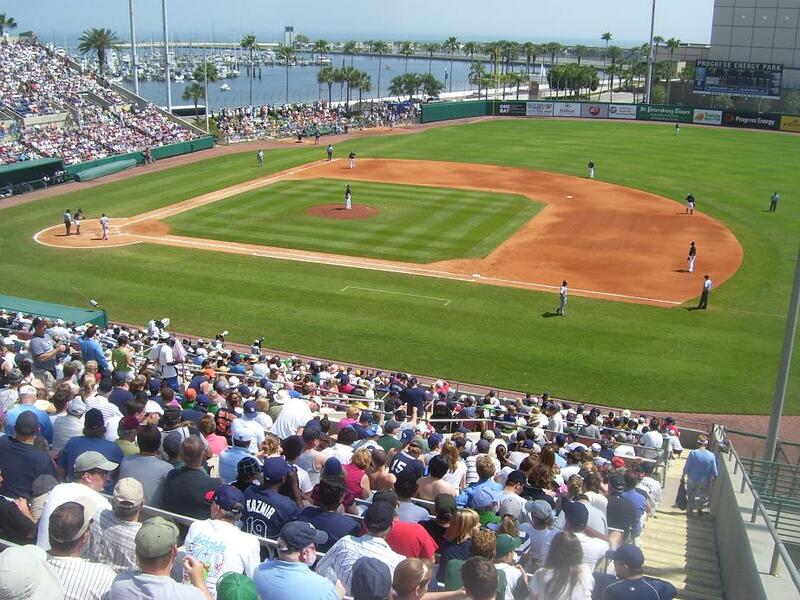 Al Lang Field is an old spring training Park in St.Petersburg where Babe Dahlgren probably played. Babe Dahlgren was enjoying the off season after winning the 1939 World Series with the New York Yankees baseball club. Back home in San Francisco he decided to meet with a local batting instructor for the San Francisco Seals of the Pacific Coast League to get some friendly tips. When he re-joined the Yankees in St. Petersburg, Florida, for spring training, his manager was suddenly very cold towards Babe. Unbeknownst to Babe, the batting instructor was a long-time enemy of his baseball manager. And now his baseball manager no longer wanted anything to do with Babe, despite his great fielding abilities and steady bat. In those days smoking marijuana could get you kicked out of baseball for life. Of course the manager had no proof, but his position gave him enough influence and power to get Babe traded to another team, even though he was a great fielder and batter. The rumor seemed to follow Babe as he got sent from team to team. Babe wondered why he kept getting traded while he was leading the league in several categories. It would be years before Babe would learn that a rumor was going around about him. In a meeting with his team executive, while playing for the Brooklyn Dodgers, he was asked about doing drugs. The team executive used the rumor to try to intimidate Babe to go down to the minor leagues. Babe did his best to try to clear his name of this rumor, but trying to find out who has heard a rumor is like emptying a box of feathers into the wind and then trying to gather them all up. They are impossible to trace and recover. Matt Dahlgren goes on to write that this Brooklyn Dodger executive was the same man who brought Jackie Robinson into major league baseball and broke the foolish color barrier that had for so long oppressed the United States. I was perplexed at the inconsistency in this executive, but then I realized he represents the entire human race, even many Christians. On one hand he is a hero who relieved oppression by breaking the color barrier in baseball. On the other hand, he caused oppression for Babe by continuing the rumor. I laid the book down for a moment and prayed that God would keep me from doing like what was done to Babe. Babe loved the game of baseball and devoted himself to his team, yet his manager turned against him just because Babe talked to someone he did not like. Then others carried the rumor further, and still others used it as a weapon to blackmail and oppress Babe. We need to be careful that we do not participate in any way by listening to and intentionally or unintentionally spreading rumor that will hurt others, as mentioned in this week’s SS lesson. While we think of political and social oppression and corruption being carried on in the world, let’s be careful we are not carrying it on in the church. When rumors hurt people’s ministry, the cause of God suffers. Satan uses rumors to not only hurt the people the rumor is about, but to also taint or destroy their ministry to the point where their ministry is no longer useful to save lost souls. What a tragedy! It has been said that “sticks and stones may break my bones but words may never hurt me.” Nothing could be farther from the truth! Many people who have been abused physically as well as verbally say they would rather be physically abused than verbally abused. Physical abuse hurts the body but verbal abuse wounds the depths of the soul. I know that God can foil all of Satan’s rumors and accusations so that all things work together for good to those who Love God and are called according to His purpose. (Romans 8:28) Like many others I have had rumors told about me. One time someone told a lie about me right in public. When I was talking it over with a friend to see how I should respond to clear myself of this lie, my friend wisely suggested, “Don’t respond to the rumor. By responding you only give the rumor merit.” I said nothing and later found out that everyone else either forgot what was said that day or was distracted when the person said it, and never heard the rumor at all! That is how it worked out for me, but I know this is not always the case. This is why when I finished the book and put it down, I asked God to keep me from participating in a rumor that could destroy someone’s life! We need to ask God to give us hearts like His – filled with a love that will never participate in any way in gossip that may hurt another of God’s children, either in the world or in the church. Next Post → Does the Sign of Jonah Really Mean Jesus Would be in the Grave Three Days and Nights? Thank you for caring so much to share this with us, William. I know I have been guilty of gossip in the past, and have been hurt by it very much, as well. I am going to join you in this important prayer for it is God’s will that we love as He loves. He will certainly honor our hearts, if we are truly sincere.